Hello fellow anglers, It is that time of year to celebrate the new year and the Topaz Lake opening day fishing season. January 1, 2018 at precisely 6:46 am will be the official starting time for anglers to start fishing on Topaz Lake. For those of you driving out that morning , be careful and mindful of other drivers on the road that have might celebrated to much the night before. For those that will be camping at the lake, enjoy the night and if you decide to party. Stay at your camp site. Also a reminder, if you did have a good time the night before, I would recommend to have some one else drive the boat New Years day. You can get a DUI while driving a water craft. Lets all have a great opening day experience, and the Nevada Department of Wildlife will be patrolling the lake to insure that. For those procrastinators that did not get you boat newly registered, you can do it on line at NDOW. California anglers, do not forget to get that 2018 fishing license. This too may be obtained online at California Department of Wildlife, you will be able to print out a temporary copy until the official license is mailed to you. I received my license in three days and my boat tags in four days. The lake level is at almost full capacity, which will leave shore fishing at a minimal. The Douglas County boat ramp will be open for launching. In talking with Chuck Fields from Topaz Landing Marina, they will have boat rentals and launching facilities available at first light and the bar will be open. To contact Topaz Landing call 775-266-3550. The Topaz Lodge derby will officially start that day and run through April 15th. There is a change this year in the derby. It is open for all anglers 21 years of age on older (as it is sponsored by the lodge and casino). Any trout 2 pounds and over caught at Topaz lake may be weighed in at the general store. Which will be worth $5 free slot play and five derby tickets. Any tagged trout will be worth 10 derby tickets you will receive $100 instant cash. The largest trout each week will receive $25 cash. Second largest for each week will receive $25 in free slot play. Now for one big addition this year. The five largest fish of the derby ( one spot per angler ). 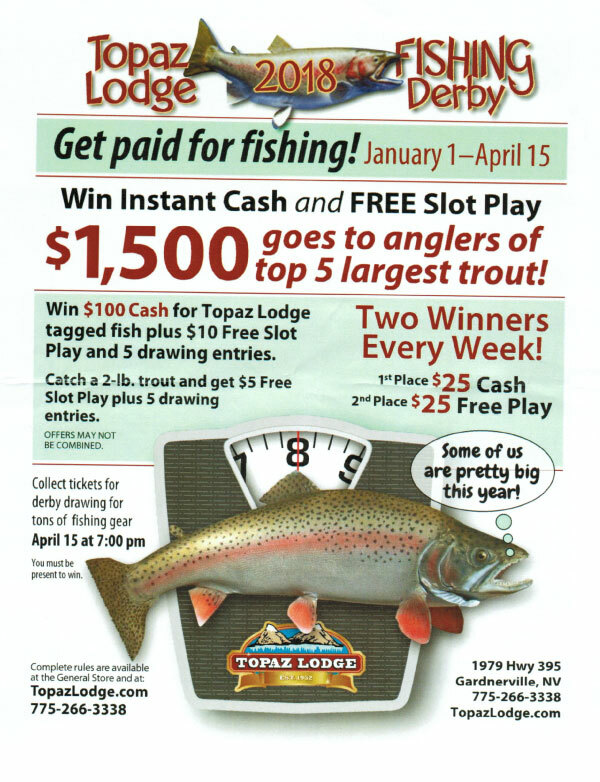 The Topaz Lodge will be giving away $1500 cash. You do need to be a Topaz Lodge club member, which you can sign up at the the main cash office. On April 15th at 7 PM there will be an award ceremony with tons of prizes given away ( must be present to win). I will be there looking for one of those massive fish that were stocked by the Topaz Lodge this year. I also spoke with the NDOW in regards to their stocking of the lake. Since October 1st of this year, they have planted over 22,000 fish in the lake., and they are not done. The department plans to do more stocking in the beginning of 2018. Where else can you get paid to go fishing with no entry fee. In f you need any more information or to make reservations, you can call the Topaz Lodge at 775-266-3338. The weather is supposed to cooperate this year with slight winds and highs in the 50's. Be careful and be smart, don't drink and drive any vehicle, or you may remember your new years day in a bad way. For those looking to do some ice fishing, I strongly recommend to use caution. With our recent weather change, many higher lakes are not stable yet. Red lake had 5 inches of ice last week, but our daytime temperatures could change that. If you have a question or a report in our local fishing area call the Nawline at 775-267-9722. Have photo of your catch, send it to dprice@receordcouier.com. I wish you all a happy NAW Year, see you on the lake. Good fishin' and tight lines.